Find out everything you need to know on the new Hyundai Ioniq from independent vehicle review website Car And Driving. You can watch the video review to the left to see more of the car or read their written review below to get a true insight from an expert in the automotive industry. Hyundai offers a comfort-orientated full-electric contender that's surprisingly appealing. 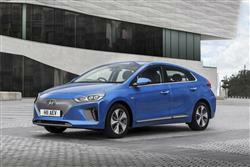 Jonathan Crouch looks all the full-electric version of the Korean brand's IONIQ model. Hyundai believes that the market-leading Nissan LEAF has had its own way for far too long in the slowly growing full-electric car segment. They've aimed this full-Electric IONIQ model directly at that car, as well as at other key segment models like the Volkswagen e-Golf. On paper at least, this car certainly seems to offer a package that eco-minded buyers in this class will want to consider. Once upon a time, Hyundai built simple, cheap, budget brand cars. Now, it makes models like this one, the world's first vehicle to offer the choice of three electrified powertrains. Welcome, to the IONIQ Electric. It's the full-battery-powered version of a design also available in our market with Hybrid and Plug-in Hybrid power - and it's very advanced indeed. But then, maybe we should have expected that. Back in 2015, Hyundai was the very first automotive maker to launch and sell a hydrogen-powered vehicle, the ix35 Fuel Cell, and in the same year, its brand partner Kia introduced an all-electric EV version of its Soul small Crossover model, showing that the Korean conglomerate had mastered battery power too. How has it done here? Let's find out. Hyundai's first ever stab at this market delivers a slightly smaller 28kWh battery than the 30kWh unit used in the segment-leading Nissan LEAF, but a usefully greater driving range (174 miles plays 155). Inevitably, the need for a battery three times the size of the one in the IONIQ Plug-in model mated to a much larger 120PS electric motor means extra weight, the kerbside figure rising by 50kgs. In fact though, because all the bulk is mounted so low down in the car, that has a positive, rather than a negative effect on driveability, reducing the bodyroll that troubles the Hybrid models at speed through tight bends. Hyundai proudly points out that an Electric IONIQ model has a lower centre of gravity than a Volkswagen Golf GTI - which is appropriate because the frantic acceleration you initially get from rest in this variant is very hot hatch-like: the 62mph point still flashes by in a fraction under 10s. Switchable drive modes give you the choice of 'Eco', 'Normal' and 'Sport' settings. There isn't a gear lever in the full-Electric variant - of course the single-speed transmission doesn't really need one. Instead, small 'Park', 'Neutral', 'Drive' and 'Reverse' buttons are provided, along with what will initially appear to be gearchange paddles behind the steering wheel, which are actually there to allow you to vary the level of regenerative braking. This Hyundai challenges the eco-motoring status quo in lots of ways and exterior design is another of them. On the battery-powered full-Electric variant, a front grille isn't of course needed - not for cooling anyway. We'd argue that it is required for stylistic reasons, the battery-powered version being saddled with a rather ugly blanking panel that can be ordered in a choice of grey shades or in polar white. Other distinguishing aesthetic features of the battery-powered model include copper-coloured trimming below the front bumper and below the side door rubbing strips. Inside, the IONIQ Electric does without the conventional auto gearlever you'd find on the hybrid variants, instead featuring a single-speed transmission system offering small buttons for 'Park', 'Neutral', 'Drive' or 'Reverse'. This frees up space for an electronic handbrake switch - on the petrol/electric model, you're stuck with one of those clunky floor pedals. With this Electric model, the designers had the headache of having to accommodate a much larger battery. To try and fit it in without too much of an impact on trunk space, they ditched the multi-link rear suspension set-up used on the Hybrid models and at the same time, discarded the space-saver spare wheel also provided with those variants. Ultimately though, only so much could be done: carriage capacity on fully-electrified IONIQ variants falls to 350-litres - or 455-litres if you load to the roof. The value of the government Plug-in Car Grant rises to £4,500 for full-battery-powered models like the IONIQ Electric, which means that prices for that variant can begin from just under £25,000, once the Chancellor's contribution has been subtracted. That sum would buy you 'Premium' trim, with another £1,800 necessary to get the top-spec 'Premium SE' model. The most obvious alternative that'll probably spring to mind here for potential buyers is Nissan's LEAF. At first glance, this car does appear to be able to undercut this Hyundai - an entry-level LEAF costing from under £22,000. Read the small print though and you'll find that this figure applies only to the old-tech 24kW model that gives you only 124 miles of driving range - way off the 174 mile figure of this Hyundai. Even the more powerful 30kW LEAF model can't get close to that (it delivers 155 miles) and that car costs around £1,200 more than a comparable IONIQ. In terms of technology and driving range, Volkswagen's e-Golf or a BMW i3 would probably represent better bets, but full-electric models like those will cost you about £3,000 more than a comparable full-electric IONIQ. Otherwise, the only other full-electric models on the market are too small and too range-restricted to merit serious consideration for family buyers. You buy a car like this expecting exemplary running cost figures and, by and large, this IONIQ doesn't disappoint. With the full-Electric IONIQ variant, a 28kWh battery offers a potential NEDC-rated driving range of 174 miles. That looks class-competitive: a 30kW Nissan LEAF manages 155 miles, an e-Golf manages 186 miles and a BMW i3 195 miles. The IONIQ's charging times stack up to segment standards too, it being possible to replenish the lithium-ion cells with a charge of up to 80% in just 33 minutes, providing you've got access to a 50kW DC fast charger. If you haven't, then a home wallbox will re-charge a full-Electric IONIQ model completely in 4 hours 25 minutes. Or, if you're somewhere with only a normal 3-pin plug to connect into, an overnight 12-hour charge should be sufficient to top the car up completely. Servicing costs will be low. After all, with this IONIQ, there's no starter motor or alternator to go wrong, no drive belts to break and no particulate filter to get clogged up with diesel fumes. The car will need a routine check-up every 12 months or 10,000 miles - depending on which comes round soonest. And you can budget ahead for garage visits by opting for one of the Korean company's fixed-price service plans. There's a three year package that covers you for up to 30,000 miles, or a five year programme that extends that to as much as 50,000 miles. Don't under-estimate the scale of what Hyundai has done here. Toyota has been perfecting hybrids for a quarter of a century and in the same period, the Renault/Nissan conglomerate has spent billions on electric car technology. Yet neither of these industry giants have produced as complete an eco-motoring solution as is served up by the IONIQ. To come from nowhere and deliver a product as competitive as this is a considerable achievement, particularly when the car in question can undercut the opposition so significantly on price. Of course, it's not perfect. The looks aren't especially arresting and some rivals can offer you a fraction more all-electric driving range. Still, if you can accept that, get on with the styling and adjust to the frugally-focused manner this car will encourage you to drive in, then we think you'll probably like mostly everything else about it. Less than half a century ago, European car makers helped establish Hyundai. Now, this brand is showing them the future of motoring. Isn't it IONIQ? Don't you think?